One of the things that frustrates me about blogging is the inability to show the kiddos talking and debating while they work. This work is from 2 kiddos I had last year who spent the entire period talking and working. As a whole, our school has chosen to focus on differentiation. This is particularly relevant, given that the recent immigrant population at our school means that some kiddos have done formal education for years (actually some of the best schools in their country, we’ve been told) while sitting next to students who studied for a few years, then dropped out. (This is not entirely an exaggeration, though I usually try not to place students in the same group that have such a wide academic gap between them). We teach simplifying and solving every year. It’s actually one of the few topics (along with area) that we’ve taught every year of this course sequence. This means that some students have seen it and know it, while some students have never seen it. So, we gave them an exit ticket. We spent one day going over simplifying with algebra tiles and then asked them to show us what they know. 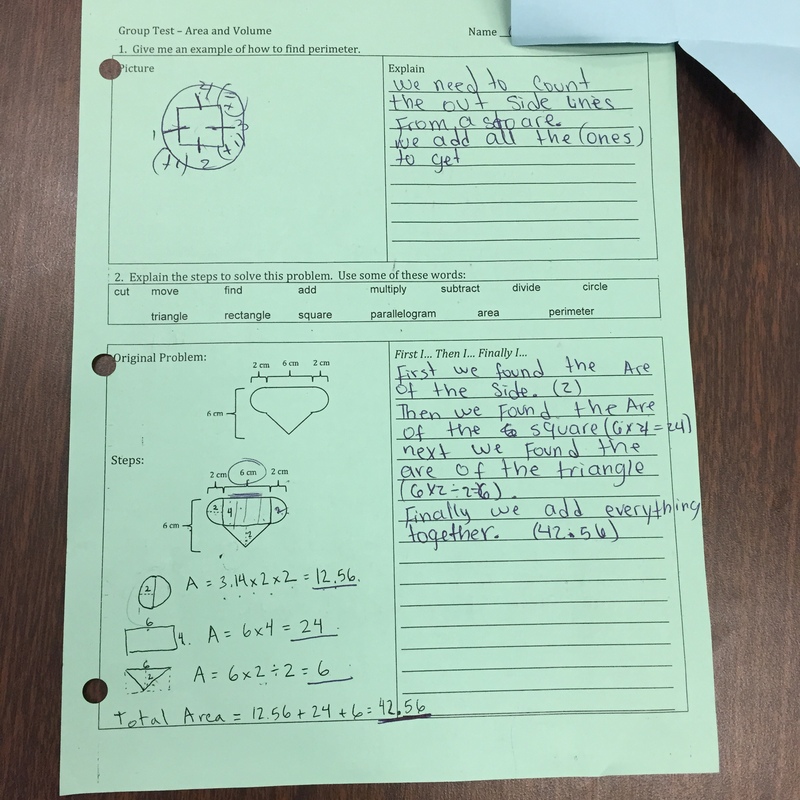 This can be tricky since one day isn’t quite enough for some students to dust off what they learned last year while others might have been confused because they can solve equations, but never learned how to use algebra tiles. Grading is the worst. Projects are challenging. We’re at that part of the Packaging Project where groups find the surface area and volume of their package. In the end, I think I gave them a C+ for that part of the project. They can do it, but I want them to explain each step. I wish I had made that clearer somehow.